Jane R. Snyder has been an ASCAP songwriter and publisher (Nothing Plain about… this Jane!) since 1995. She first studied songcraft in New York with Sheila Davis at the Songwriter’s Guild of America. Her additional teachers include: Jimmy Webb, Jason Blume, Marvin Hamlisch, David Zippel, Jon Ims, and Pat Pattison. A gifted lyricist with strong melodic instincts, Jane enjoys co-writing with writers and performers. They include: Lanny Meyers, John Nanni, Paul Rolnick, Jamie deRoy, Eric Hansen, Jack Hollingsworth, Don Holmes, Sherwin Kaufman, and Sonia. Her songs have been licensed for use on television, in film, and on recordings. 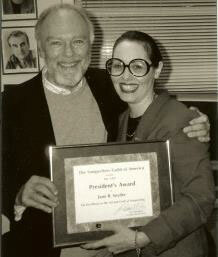 "Every Time A Train Goes By"
George David Weiss, the late president of THE SONGWRITERS GUILD OF AMERICA, presents Jane R. Snyder with the President’s Award certificate.